Men Made Easy is a practical and wonderful home study course written for women by nationally known and respected dating and relationship expert, Kara Oh, to help women transform their relationships and marriages. As one of the thousands of women site visitors to my website, I believe love relationship is likely to be a big topic in your life and you'll love to be the woman men love, so I'm sharing with you one of the best relationship programs I've read so far and let you in on how to understand men better. You don't have to settle. You can learn about what causes a man to fall in love. You can learn about your inherent power of Feminine Grace and how you can create a more joyful relationship for yourself, using the 12 Simple Secrets from Kara's ebook. Her refreshing and revealing information will open your eyes to the real truth about men and what they really want. You'll gain amazing leverage when you find out exactly what your guy wants, even if he himself doesn't have a clue about it. The highly-acclaimed ebook is an easy read as it's written in layman terms and narrative, spinning the story of three women Carol, Jenny and Beth who had been friends since childhood. It talks about how these women had settled and became increasingly frustrated, almost desperate about their individual love lives. It's through encountering a lady called Diedra that these women discovered the secrets that led them on a journey of self-discovery, self-empowerment, and eventually transforming their love lives. How did Kara, the author get to know of these secrets about men? She made men a focus of study and spent two years interviewing of hundreds of men, to find out what really make them tick! Note: This home-study course include an e-Book, an e-Workbook and audio recording and these are available for immediate download after purchase. No shipping/postal fee! I bought this program in April 2010 because I was intrigued by the book title, I was curious about the mentioned 12 Simple Secrets... but mostly because I wanted to learn of new ways that could possibly bring more love and trust into my love relationship. I would love for my boyfriend to cherish and adore me more... and learn how to get him to commit. After going through 185-pages of positive and love-enhancing ebook, I found myself shifting within and over the weeks, I'm began to experience some results in my relationship. Firstly, by embracing my Feminine Grace, I began to feel softer, more feminine and loving towards my boyfriend. I'll remind myself to focus more on his positive masculine qualities and that makes me see him in a better light, and I'm appreciating him more than ever. I've discovered more about myself and what I would like to experience more in my relationship. I've also learned of new techniques to better interact with my guy and men in general. If I've not read Men Made Easy and tried out the secrets, I believe I would have a harder time trying to figure out what's with my boyfriend, and probably feeling a lot more disheartened that our relationship has settled into a "routine". I'll continue to learn and practice the 12 Simple Secrets in my relationship. In Le Guin's beautiful words, "Love doesn't sit there like a stone. It has to be made like bread; remade all the time,...made new." The exercises that come in the accompanying workbook helped me to get a lot more out of the ebook. From doing the exercises, I uncovered more about myself and my expectations on my relationship with my boyfriend. So do attempt to do each exercise that comes after each chapter and try not to skip over them as I was tempted to at first. I really like the audio recording where Kara read the book in its entirety! It's so useful as I could take my tired eyes offline and just listen to the audio. I feel that the audio recording is already in itself worth the program price. 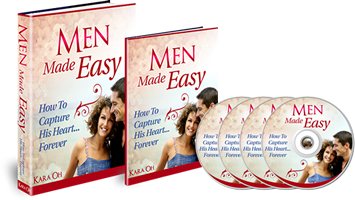 If you've been looking for secrets that could transform your love relationship, I would highly recommend you to get Men Made Easy !